Recent Google research described a case study of a woman in the market for a new car, who explored 14 brands over the course of 3 months, through the prism of nearly 1,000 digital touchpoints. Once upon a time, that purchase would have consisted of a copy of Consumer Reports, asking a friend, two or three trips to a car dealer, and one talented car salesperson. Customers are smarter than ever before, and the impact of this trend influences the business to business sector as well. Yelp-for-businesses platforms like G2 Crowd or Capterra facilitate software research, while B2C e-commerce is being replicated for B2B by companies like Alibaba. Of course, adaptations are made in the B2C to B2B transition; Amazon Business, for example, offers tiered pricing, quantity discounts, CAD models, company profiles, and quality certificates on their business portal, all features that don’t exist on their consumer store. Here at Freightos, we’re firm believers that more available information makes for a better freight experience. Last year, as part of our mission to encourage transparency in the freight world, we launched the free Freightos International Freight Index, providing insight into the rapidly changing world of ocean freight.Today, we’re taking that three steps further. And it doesn’t cost a cent. 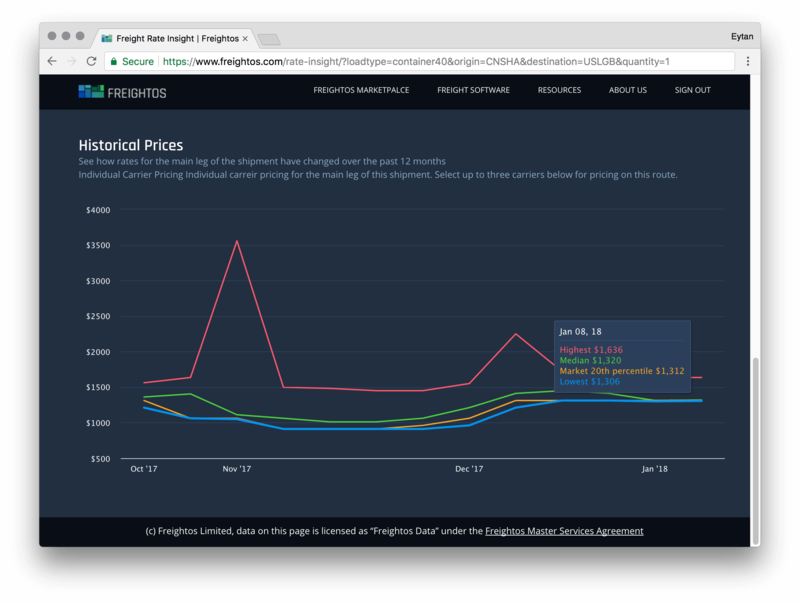 Our new Freightos Rate Insight platform goes beyond the index, providing port-level insights into current and historical ocean prices. And it does it on an individual carrier level as well, making it easier than ever before to get live market information. Current and historical carrier pricing comparisons at various price ranges makes unprecedented trend analysis a reality as well. Beyond incorporating carrier-level data, we’ve also including more insights into price distribution. Search results with sufficient coverage will display high, median and low prices, as well as origin and destination charges. In many cases, pickup and delivery prices are also available, shedding light on the entire freight shipment. This is a major step in the direction of global freight visibility and not one we take lightly. As we’ve said before, the degree of service that companies provide will still play an important role in driving logistics provider decision-making. However, increased visibility is an inevitable part of our industry’s future. We’re proud to be the ones that usher it in.